A first-of-its-kind community initiative which encourages healthy engagement with neighborhood RWAs while delivering maximum benefits to its members. This programme entitles its members to avail free and discounted services. For this, a Privilege Card is issued to respected members – to be shown during their visit. This card enables the members to enjoy an array of exclusive benefits specially designed for them. Q. Is it neccessary to carry the Fortis Neighbourhood Plus Privilege Card? To easily avail the array of free and discounted services at the nearest Fortis Hospital, we request you and your family members to carry the privilege card whenever you visit. Q. Can the offers be availed at any Fortis Hospital? 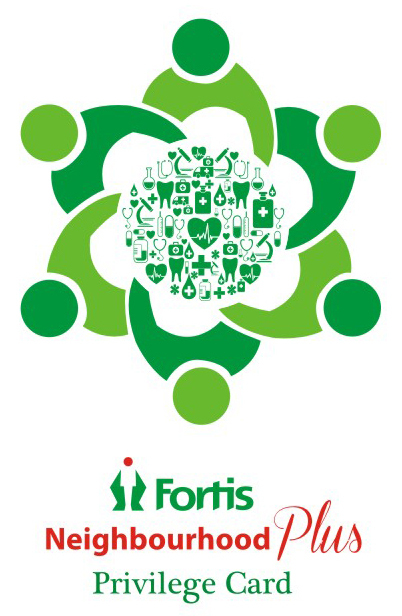 The Fortis Neighbourhood Plus programme is locality-specific and is available to only select RWAs like yous, Hence, the offers can be availed at the nearest Fortis Hospital only. Q. Can the Neighbourhood Plus Card be transferred to other individuals? The Programme entitlements are only for the card-holder and his/her family memebers listed under the programme. Q. How often can the Neighbourhood Plus Card's free and discounted offers be availed? A. The free benefits can be availed once a year (or the number of times specified), while the discounted benefits can be availed any number of times. Q. How can my family members use this card? A. Names of all your family memebers are mentioned on the card. Please ask them to furnish the membership card at the front desk to avail the programme benefits.